During this service learning trip, the coed group immerses themselves in Mexican culture, learning about the local people, language and traditions, and even working on a sustainable farm. 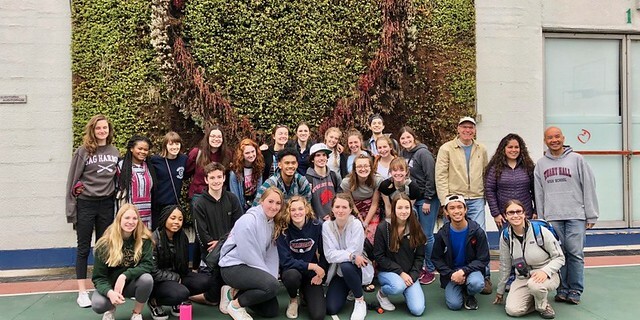 While the entire sophomore class is in Costa Rica, a smaller group of 13 high school students is spending the week of January 13–19 in Mexico. Starting in Mexico City and then moving south to Cholula, the trip combines cultural immersion with service projects. Shortly after arriving in the capital, Convent & Stuart Hall students meet up with a group of students from Duchesne Academy, our Sacred Heart sister school in Omaha, Nebraska. The two groups get to know each other quickly — bonding around shared experiences — and then spend most of the week touring, serving and living together. The trip kicks off with visits to the Basilica of Our Lady of Guadalupe, the Frida Kahlo Museum, the Leon Trotsky Museum and Colegio Sagrado Corazón, one of six Sacred Heart schools in the country. After driving about two hours south, students discover rural Mexico and settle in for two days of work and learning on a sustainable farm. The property's spectacular views of Popocatépetl, an active volcano and the second highest peak in Mexico, provide an ever-present backdrop for the experience. Convent & Stuart Hall students first journeyed through Mexico with the same itinerary in 2013 and have returned to the region around Mexico City most years since. Select the images below to read daily blog posts. You can also follow the trip by browsing the photo album above, where photos will be added as they come in.